Oval track greyhound racing goes back to the 1920s in Ireland and they have a long history of breeding the dogs for those races and those in the UK. GALT is happy to have Rolo (and his companion Ned) join us from that heritage. 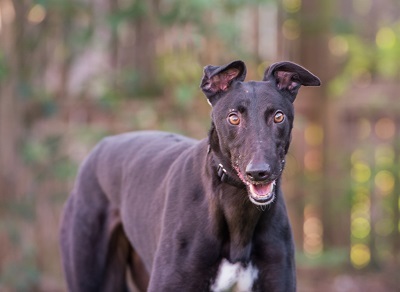 Rolo, racing name, Mercury Dynasty, is a 3 1⁄2 year old black male who comes to us from Ireland by way of A Grey’s Home in Belgium. Born in June of 2013, his sire is Droopys Scolari and his dam is Coosane Champ. He has 18 races on record. He had a muscle tear in a rear leg but has completely healed at this time. 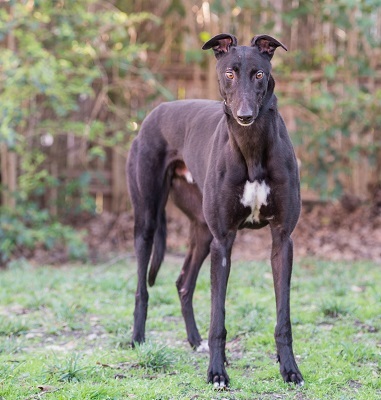 Rolo is an outgoing and affectionate hound and is very well behaved around children. Rolo is not considered to be cat or small dog friendly.